The Atlantic Margin beds extend from SouthEastern Massachusetts to Florida. I have -- quite arbitrarily -- excluded most Pleistocene, Holocene and very recent fossiliferous deposits often found in anomalous places such as Canada's Ottawa River Valley and will discuss them in a separate Terrane writeup. I have also -- again arbitrarily -- excluded deposits along the Gulf Coast similar to those of the Atlantic margin. Those deposits have a more or less uniform stratigraphic terminology that differs from the contemporaneous Atlantic margin deposits. And they serve as a bridge into the Cretaceous Inland Sea deposits of the plains and Rocky Mountain states and provinces. They will be discussed in another writeup. Ideally, it might be best to put everything into a single table with states across the top from Florida on the left to Massachusetts on the right and geologic age on the vertical axis. But pragmatically that would require a lot of scrolling to get to the right side. So, I'll break this into tractable subsets. In general, the deposits are unaltered and often poorly consolidated sediments. The terrestrial rocks are siltstones, shales, clays and conglomerates. Fossils consist of a few vertebrate bones and teeth and occasional plant fossils. The marine rocks are shales, sandstones and limestones. Invertebrate fossils are very common. In some places, marine vertebrates and fish teeth and bones are quite common. Atlantic margin rocks in New England and New York exist only along offshore islands and a small area in SouthEastern Massachusetts. Where present, they are usually buried under glacial debris and are very poorly exposed. Known exposures of Cretaceous beds are on Long Island, Staten Island, Block Island and the Elizabeth Islands near the South side of Cape Cod. 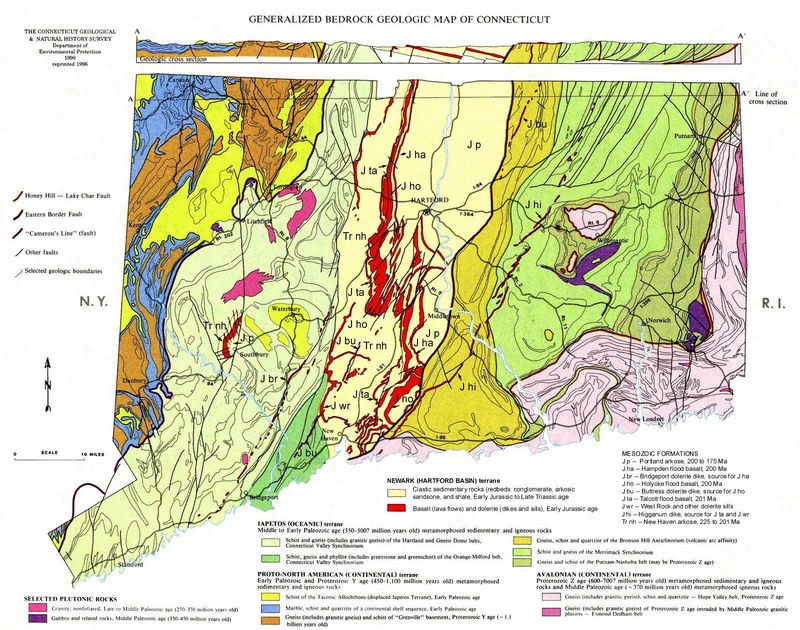 Eocene deposits are exposed in SouthEastern Massachusetts. Cretaceous, Miocene and Pleistocene exposures occur on Marthas Vinyard. Pleistocene fossils are found on Nantucket. Atlantic margin beds are found in New Jersey East of a line from the head of Raritan Bay to the Delaware River at Trenton and thence Southward through Wilmington, Delaware, and Maryland through the North central part of the District of Columbia then South to Smithfield, NC. The Atlantic Margin formations are found East of the line from Richmond, Virginia to Smithfield, North Carolina. From there the outcrop is offset West to a point SouthWest of Raleigh and then Southwest through Columbia, SC to Augusta, Georgia. The Atlantic Margin beds are found South of a line from Augusta on the Georgia-South Carolina border West to and beyond Montgomery, Alabama. These beds largely use the same nomenclature as the Gulf Margin beds further West. The entire Florida Peninsula including the Panhandle is covered by Atlantic Margin beds. Chesapeake and Delaware Canal, New Castle County, DE -- Cretaceous mollusks, a few shark teeth. Collecting permitted from old spoil piles near Reedy Point Bridge, St Georges, Summit Bridge and elsewhere. Calvert Cliffs, Calvert County, MD -- Miocene mollusks and shark teeth between Chesapeake Beach and Drum Point. Public access is limited and may require a fee, but is available at Chesapeake Beach, Plum Point, Calvert Cliffs State Park, and Flag Pond. Collecting is permitted along beach, but not in cliffs. Yorktown, York, VA -- Area exposures, streams, road cuts, etc between Williamsburg and Yorktown. Abundant, well preserved, Miocene mollusks. A few vertebrates. Legality of collecting is questionable, but permission can probably be obtained. Aurora -- The Gulf PCS Phosphate Mine at Aurora, Beaufort County, NC is a major source of Miocene and Pliocene mollusks and vertebrate teeth. Collecting at the mine is restricted to a few weekend days a year with slots signed up in advance and tightly allocated, but dump material from the mine is said to be available at the Aurora Fossil Museum as well as in local DWP road material dumps and in areas in the region that have been filled with mine material. Peace River -- Along the Peace River, DeSoto County, Florida between Gardner and Acadia, Florida at times of low water. Fossils are generally found on the creek bottom rather than the banks and are collected by scooping/diving. Pliocene and Pleistocene land and marine vertebrates. Tampa -- In Miocene outcrops in Tampa Bay and in area excavations. Miocene Fossils -- silicified corals, mollusks, vertebrates. Sharks Teeth were once abundant 30 km to the South along the beach at Venice, but beach reclamation projects in the late 20th Century are said to have covered the offshore beds from which the fossils were eroding.